Sorry for the lack of posts, but I had a nasty case of strep throat last week which brought with it a high fever. The most energy I expended last week was getting from the bed to the couch and then back to the bed. Lucky the antibiotics kicked in in time for the weekend and I was back in business for the Super Bowl and ready to cheer on the Ravens to victory (woo hoo)! 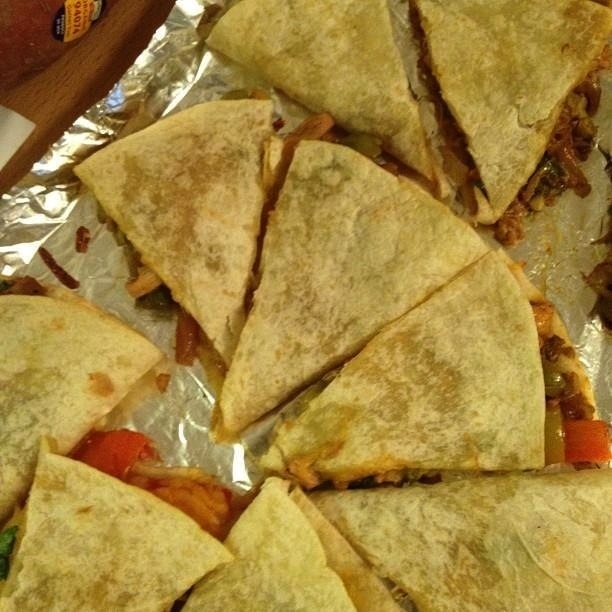 And what better way to celebrate the Super Bowl than with my Game Day Quesadillas. I’ve been making these for years with a pinch of this and a dash of that. I’d love to tell you that before writing this post I took the time to actually measure out the ingredients, but I’d be lying to you and that just doesn’t seem right. Anyway, you seem like smart people so I’m sure that you can figure out what proportions taste good to you. I always make these with chicken, but they could easily be vegetarian, beef or pork. Marinate chicken in buttermilk, beer and a whole bunch of crushed garlic cloves for several hours to overnight. Preheat until to 475. Bake chicken thighs until cooked through, about 20 minutes. Allow to cool to room temperature and shred. Set aside. Heat oil in a large sauté pan. Sauté peppers and onions until soft. Toss in to a bowl with all spices to your taste. Add olives, jalapeños, and cooked chicken and toss checking again for seasoning. Place one tortilla on a plate. Cover with a bit of the chicken mixture, the fresh cilantro to your taste and some of the cheese. Cover with another tortilla. Either bake in the oven or put in a dry non stick pan and cook until cheese is melted and tortilla is slightly crisped. Yields A LOT! This is party food. This entry was posted in Uncategorized and tagged Chicken, Sports, TexMex. ← U is for… USA; Puerto Rico’s in America! My mouth is salivating. I might have to make this for my boys next week when “my” big game comes on (UNC vs. Duke!). If you do, let me know how they come out.